Kathy mentioned in her blog, Skippy’s Vegetable Garden, that I’m selling Winter CSA shares. I know, it seems a bit early to be thinking about winter, but it isn’t really. Not if you’re growing the food for it anyway. 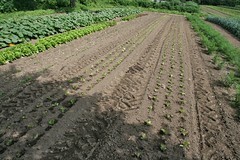 I’ve provided links to detailed information about the Belmont CSA winter share in the side bar. I’m putting together a list of frequently asked questions and also hope to post storage tips soon. In addition to posting about how things are growing in Belmont I’ll provide crop reports from the other farms involved in the winter share. Eight inches of rain in a week! Joke’s on us this year! [An irrigation system was installed at Picadilly this spring!] I’ve already moved ahead, to focusing on fall crops. The newly germinated beets took a hit (some just washed away! ), but I think it’s still a decent stand. Carrots are fine. I’ve been delayed in planting the second carrots, so we’ll have to keep them well tended to help them size up. Squash, parsnips, celeriac are sizing up beautifully! Onions have taken a hit – they seem to be rotting/dying back, before they’ve really sized up. We’ll have to see how they look after some sunny weather. 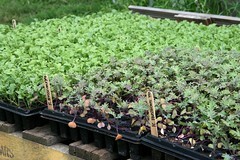 We’re scurrying this week to catch up on transplanting and weeding, since we couldn’t do anything last week – broccoli, cabbage, cauliflower, napa cabbage, and much more, all to go in. Planting for the Winter Share is in full swing. Last week I planted over 900 heads of radicchio. Mostly I planted indigo and sugarloaf varieties, but I threw in a few Trevisio because I think they are beautiful. Next week the collard greens, kale and escarole go in. Some of the storage onions have been harvested. My onions seemed to have the same problems as Jenny’s, so I decided to harvest half of them a bit early, sacrificing size. I’m keeping a close eye of the rest of the onions and will harvest them in the next two weeks.